Goldie The MVP sitzt zur Zeit im Bundesgefängnis von Yazoo City, Mississippi ein, wo wir ihn für ein – offensichtlich sehr willkommenes – Interview ausfindig machen konnten. Auf nicht weniger als achtzehn vollgeschriebenen Briefseiten ist die Straßenlegende aus ‘P-Cola’ nochmal ausführlich ihre ganze Musikkarriere für uns durchgegangen – vom allerersten Release in Deutschland (!) über die Geschichte der Royal Riders bis zu den Gerichtsverfahren, die ihn 2012 schließlich für lange Zeit hinter Gitter gebracht haben. Tell me how you first got in touch with (rap)music when you grew up on the Eastside of Pensacola. I am Pensacola. Born and raised. Originally from a hood called the Tanyard which is on the Southside but when I was young my mom and dad split and my dad’s new girlfriend lived on the Eastside. I would go and stay on the Eastside every weekend with him and her. She had a son that was a few years older than me named Eric who became my big brother and introduced me to my first love… rap music. This was way back, Sugar Hill Gang back in the day. When I hit the 3rd grade I remember a song named “Jam On It” came out (this was early eighties) and seemed to change the world. That’s when I wrote my first rap. After that, my mom joined the military and we moved around as she got stationed different places and I took my love for the music with me everywhere we went. I would always go back to Pensacola every summer and stay with my dad, but my 11th grade year I moved back to Pensacola and this time I found my wicked mistress… the dope game. And soon after that me, my first love (rap) and my wicked mistress (the dope game) were involved in a ménage à trois which resulted in the birth of Goldie. Did you release any underground demos/tapes prior to the Royal Riders album? Actually, when I was in the 8th grade my mom was stationed in Hanau, Germany and I recorded a few singles that were put out on vinyl. One was under the group name Chemistry which was me and a female vocalist named Stacey Williams. The name of the song was “Friends”. The other two singles were cover songs (that’s what they called them back then) where I rapped on top of tracks that were hot at the time. One was “Keep It Up” (some ‘Eye Of The Tiger’ meets ‘Snap’ type track) and the other was on this crazy Madonna ‘Justify My Love’ track. Wow, I’m just realizing they were doing mixtapes in Germany way back then. I can’t remember the label (I was young) but I think it had a worm logo or something. 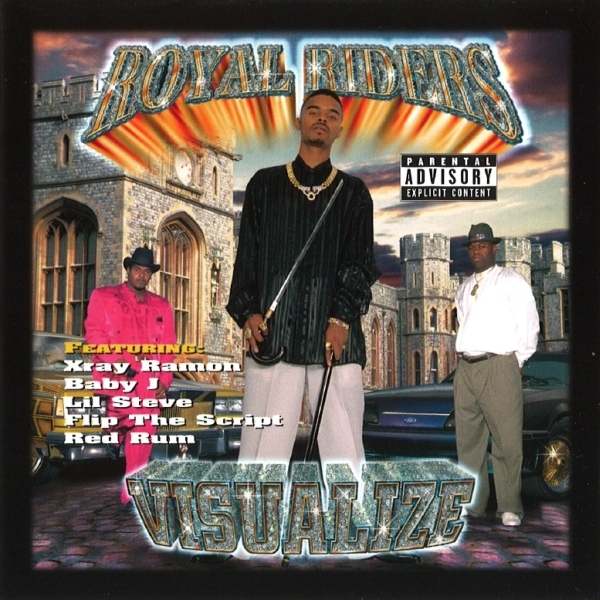 [editor's note: Ohrwurm Records] But the Royal Rider “Visualize” was the first complete project. When and how did the Royal Riders get established? Tell me about the crew. I’m the heart of Royal Riders. Curtis Atwood (Cool C) he the muscle. Tony Tucker (King Tuck) he was the brain. Those the three you see on the cover of “Visualize”. Originally the Royal Riders were me, Cool C and Red Rum (Dwight Devaughn). We got together late in 1996 as a group. We each might grab the mic at the club every now and then so we knew each other could rap, but late ’96 Tupac died and it seemed like the world stood still for awhile. Like something personal happened to everybody that loved rap music. It seems like that motivated us to start recording. Not to replace Tupac in the world but to fill the void Pac left in our life when he died. The music was for us to have something to listen to. One day Tony Tucker (who I met though his brother Bruce) heard our demo tapes and said he wanted to put some of our music out. So I introduced Tony to Cool C and Red Rum and we hit the studio. Soon after that, Red Rum went to prison. At that point, Tony Tucker stepped in to represent for Red Rum. That’s how it came to be us three for the first project. After that Young Corleon (Steven Dunklin) came on board and Tony Tucker stepped down so he could continue producing which was his passion. At that time Ramon Mims (X-Ray) was making most of our tracks and our two hype men slash security were Big Ant (Anthony Brown) and P Did It (Damien Johnson). The last member of the Royal Riders was a youngster that I recruited and adopted as my little brother when I saw the spark of what would later grow into the flame of the hottest rapper (in my opinion) to come out of Pensacola – Remy Redd. How do you remember the recording process of the “Visualize” album? Man, that period of time was crazy. Me and Cool C were deep in the game. Watching the feds snatching up dudes left and right. Three of our homies – La Drake, MoMo and Todd – had just got indicted by the feds and everybody was wondering who’s snitching. We was smoking blunts back to back and going to the studio to ease our mind. What I remember most was us not listening to any music during that time. The only thing we had in our cd players were instrumentals that X-Ray had given us. Tony Tucker had built a studio out in Cooks Hill, right outside of Pensacola. We called it ‘The Country’ because it was so far out that it was actually on a dirt road. By the time we drove way out there we felt like we were on a temporary time out from our D-boy drama and we were just blowing off steam and having fun at the same time. Back then you were affiliated with another local rap group called Avenue Mob. Who are these guys? Avenue Mob is like the little brother to Royal Riders. The founding member T.D. Teflon Don is right off 7th Avenue and Scott St. We used to have the block on fire so instead of 7th and Scott everybody called our block 7th and Hot! So Avenue Mob (being T.D., Delo and Poosey) saw us doing the lil’ rap thing and started making music, too. We jumped on one of their tracks called “Beef Wit’ The Eastside” and me and Cool C paid a local camera man (Steven Frame) to shoot them a video for it. What other connections did you have in Pensacola? How do you remember the local rap scene at that time? Well, when you say connection I can’t help but think about and mention O.G. Third Degree (Herbert Fletcher). All The Royal Riders that I mentioned earlier are what we call honorable Royal Riders, but we have a couple close homies that we refer to as honorary Royal Riders and O.G. Third Degree is at the top of that short list. He stayed in the studio with us and made moves in the streets with us. He dropped some hood classics including “Duck Lane Swang” (with Remy Redd) and he represented the spirit of Royal Riders when we ended up getting locked up. He passed away (in a way I’d rather not say) but his memory lives on. As for the local rap scene at the time I’d say that was the defining time in our city because prior to Royal Riders I only remember two projects in the city. 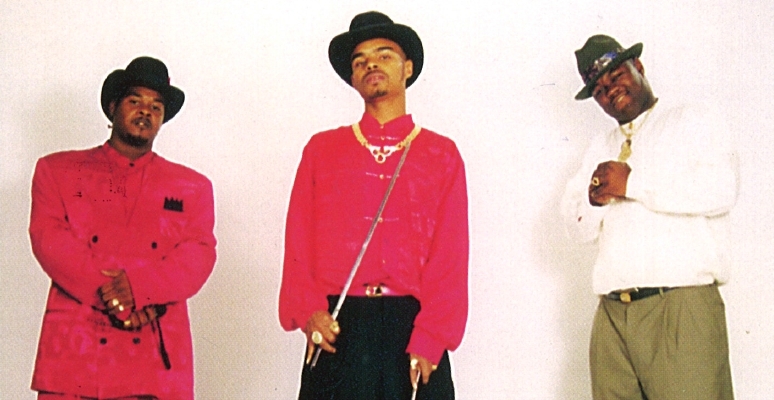 The first being a group called Rated PG’s (which was Dynomite D and Teddy Wheat) who were produced by the boxing legend Roy Jones Jr. (also from Pensacola) and the other being Nashon who had a song called “International Hustler”. It was actually seeing Nashon drop his cd that motivated us to go ahead and do it. Nashon is a good friend of me and Cool C and spent a lot of time in the studio with us. A little bit after that I remember the Warrington Celebrities dropping a joint but then we got locked up. Later (after we were in prison) Platinum House came out. And now, it’s a lot of rappers in Pensacola. A lot of them are good, too. I especially like an artist named Maimbo. He got a unique flow. Your albums have some of the finest Pen & Pixel artworks ever. How did this come about? Did you travel to the P&P head office in Houston? Thank you. That concept was all mine but the bringing it to life was 100% Pen & Pixel. Those guys were the best. This was around the time that Master P’s No Limit was making all the noise and we noticed that Pen & Pixel did their artwork, but when Snoop Dogg signed with them and we saw that cover it was like “man, that’s fly!”. So we wanted to get with them. Me and Cool C were already familiar with Houston so we did go out there and meet them in person. Everybody there was cool. They ended up liking us so much that they came to Florida and shot us a video. It was a big deal back then for Pen & Pixel to come to Pensacola and shoot a video for some local guys. I remember the whole city coming out to support us. Pen & Pixel gave us a good deal but Tony Tucker footed the bill for that one. What’s the concept behind your solo debut album? Why did you call it “KKKonspiracy”? That first project is like a snapshot of my state of mind at that time. I was in that diamond-studded electric chair because it represented me putting my life on the line (hustling) chasing money and material things. I had the White House on there because I had read up on the Contra scandal where Oliver North and other government workers were bringing cocaine into the country and selling it to fund some soldiers and I was thinking how crazy it is for them to bring in drugs and then put us in prison for using and selling them. 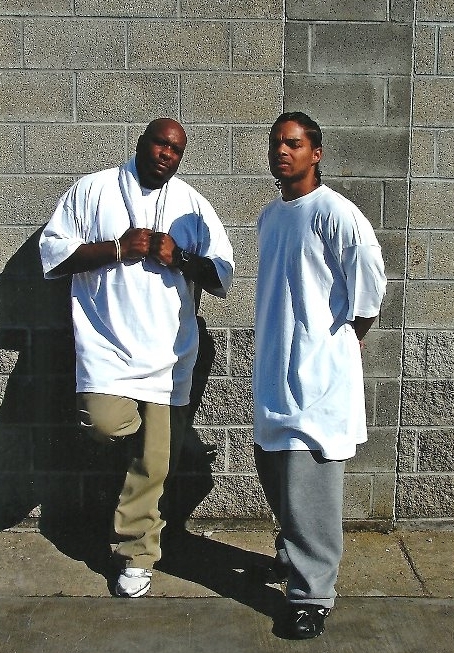 The background was half prison half cemetery because it seemed like all my homies were either dead or in jail and it seemed like I was headed to one or the other myself. The title “KKKonspiracy” was my way of describing how the judicial system is working in America. The KKK of course being a hate group that went around killing and hanging men for the color of their skin. Conspiracy is a term the federal government uses to charge people with drug crimes. It basically means that you don’t have to get caught with any drugs at all but if somebody says you had, sold or bought drugs, they’ll charge you for it. The people saying these things are in trouble themselves and hoping that they will get their prison sentence reduced by telling on others. So basically they have all the motive in the world to exaggerate and lie. So you have people getting snatched off the street because somebody (in trouble) ‘said’ they had some drugs. And the person doing the telling often lies about the large amounts and the person gets a lot of time, sometimes life sentences in federal prison. No parole. So, when I looked around and saw that all the conspiracy charges in my city were being handed out to people of a certain color it reminded me of what I read in the history books about the KKK when they were targeting the same people. The method changed but the mission was the same. 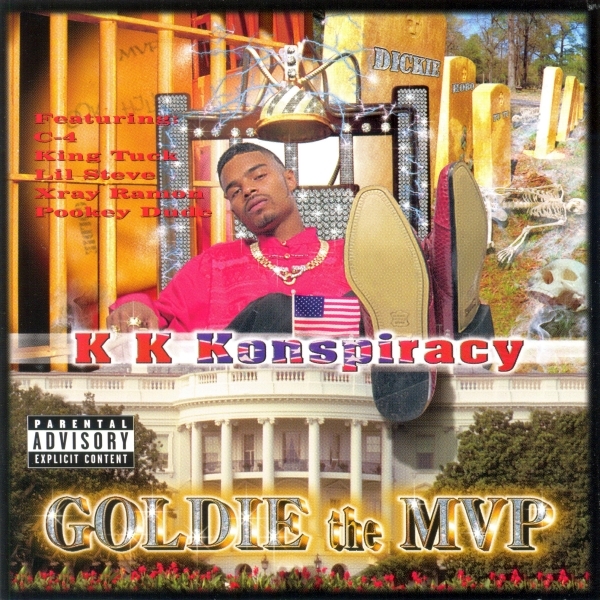 So I called my album Conspiracy but replaced the C with KKK. Note also how I had the rebel flag inside the letters. That was over 15 years ago and they just took down the rebel flags here about two weeks ago. That flag represents racism and is just coming down from government buildings in 2015. How much media coverage did you get at that time? Well, as I mentioned earlier Pen & Pixel came and shot a video for our song “Kinfolk”, so we got a segment on the local news and the paper. But a few month later we (Royal Riders) were charged with a federal drug conspiracy. 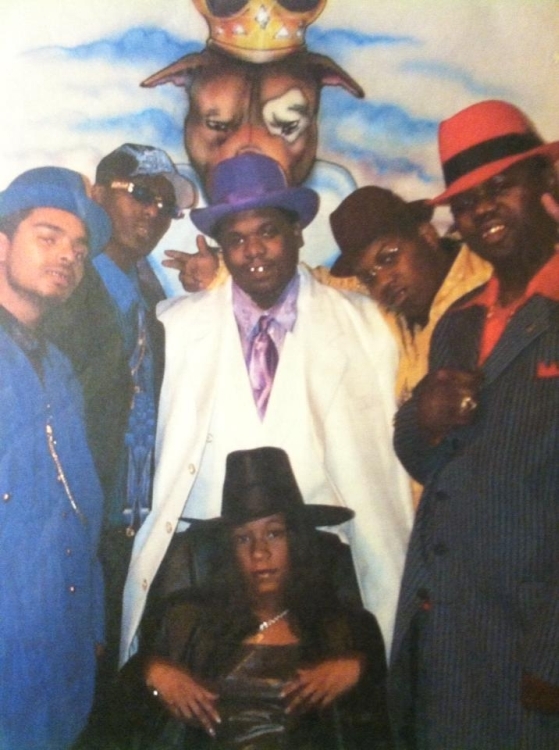 Five of us were indicted together: me, Cool C, Young Corleon, P Did It and Big Ant. We all went to trial together. Nobody snitched. They ended up bringing in people we didn’t know and never dealt with to testify on us. These were people already in prison that they (the government) brought in to testify against us to get their sentences cut. This kind of snitch activity is called ‘Testilying’ because they are sworn in to testify but get on the stand and lie. I was sentenced to 8 years, Cool C got 10 years, P Did It got 9 years and Young Corleon and Big Ant got 6 years each. So basically, right after dropping “Visualize” and “KKKonspiracy” (which we released on the same day) we all got locked up. Which song means the most to you from today’s point of view? Hmm, some artists say that each of their songs is like one of their children so they can’t pick a favorite, but me personally I look at a song as a mood. Like each song is the ‘mood’ I was in at the time. I think some of my music was negative (looking back) but to me it just shows I was in a negative mood that day. But if I had to say which one means the most I would pick “Baby Girl” because it was dedicated to my daughter. One of my favs on the album is the final track “Paranoid”. This song is like a horror movie on wax. How did you come up with the story? Horror movie on wax? I like that. I guess my earlier answer about the ‘mood’ applies here. I was smoking some major marijuana back then so that was at least part of the inspiration. You just gave me a good idea with the horror movie comment though. After that you dropped a soundtrack to a novel you wrote. Tell me about both. Well, as I said there was that eight year prison sentence I had to do. When I got out I was on supervised release (federal probation) and I was doing music. I recorded a song called “Black Friday” that the city was feeling and started doing some more recording. But I violated the supervised release (long story) and had to do 24 more months. It was during that time that I wrote my novel “Tears”. So when I got out I published my book and since I could never leave my first love I dropped a soundtrack to the novel. I figured movies have soundtracks (and alot of movies are adapted from novels) so why not a novel? Do you still write today or was this a single attempt? Yeah, I still write. I’m almost done with my new novel right now. I love writing. To me, a novel is like a 250 page song. I want to put out some more novels and continue with the same format of dropping a soundtrack with each one. I visualize the soundtracks being a compilation of different underground artists. After that you dropped another promo CD but – just like the 2nd Royal Riders CD – the album never got released. Was this around the time when you finally got incarcerated? What happened? My novel came out in September 2011 and the feds picked me up on February 2, 2012 on a new conspiracy. I been locked up ever since. That promo CD was released while I was in the county jail waiting to go to trial. I did the skits from the phone in the county jail. As for what happened, I had met a guy at a grocery store (in the parking lot) in October 2011 and bought 10 pounds of marijuana. The feds had been investigating the guy and had followed him to the grocery store. So they snapped a picture of me and him talking in the parking lot. Then four months later they came to my house and got me and charged me with conspiracy. The thing is that they charged me with cocaine – but I had bought marijuana from the guy but of course the drugs were gone by then. So I would have plead guilty to marijuana but not cocaine. When I went to trial the guy got on the stand and said he sold me cocaine. He was working with the feds to get his time cut so he lied. So basically, they added up all the cocaine this guy said he sold in a six month period and sentenced me for it. In a conspiracy you’re responsible for what other people do. With that being said, I got sentenced to 30 years in prison and I didn’t get caught with no drugs and they lied and said the marijuana was cocaine to give me more time. A picture standing in a parking lot and the words of a snitch testilying to get his time cut. He only got 12 years at that time and is presently about to testilie on some more people to get another sentence reduction. That’s how the snitch game goes. It’s called 5KI and Rule 35. Me personally, I feel like you’re less than a man if you go that route. So you’re serving a sentence on Florida 3 strike law right now. Do you want to share some thoughts about your everyday life behind bars? In Florida state we have the 10-20-life law, but my case is federal, not state. I’m charged with conspiracy. Like I said, basically some he-say she-say word of mouth. I didn’t get caught with no drugs at all – but I’m sentenced to more time than people who committed murder. Life in here is designed to break you down, point blank. But at the end of the day, it’s whatever you make of it. I see younger guys coming in here all the time and I can’t help but think it’s by design. The United States has only 5% of the world’s population but 25% are getting sentenced to life with no parole. Non-violent drug offenders are getting sentenced to life with no parole. 1 out of 100 adults is locked up in America. And guess how many of them are minorities? It’s 2015 and all I see is KKKonspiracy. God. I read the bible everyday. My favorite scripture is Genesis 50:20. It says “But as for you, ye thought evil against me; but God meant it unto good, to bring to pass, as it is this day, to save much people alive”. That scripture is about a man named Joseph. His brothers sold him into slavery and then when he was a slave somebody lied on him and got him put in prison. When he came out of prison he ended up being next to the leader of the nation. Those same brothers that sold him into slavery ended up coming to him for help. And that’s when he said those words to them. Joseph saw that if they had never done him wrong he would not have been in that prison where he met his destiny. So basically, I know the people that conspired to put me here did so with evil intentions. But I have faith that God will make even this work for my good in the end. 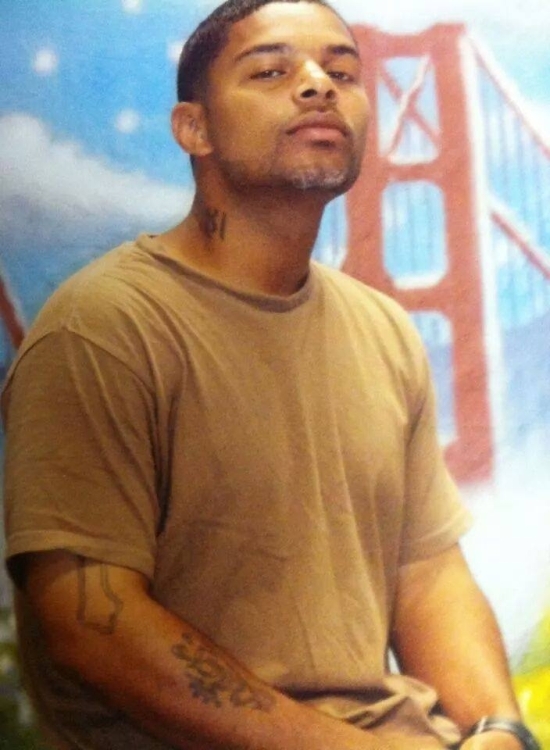 Would you have the possibility to record music straight out of jail if you wanted to? Na, we can’t record in here. I’ve heard of people trying to do it over the phone but I’m not sure about the quality. Plus we only get to buy 20 calls a month. 300 minutes max. And that goes by fast trying to keep in touch with my family who I love and miss very much. Do you have a particular message to your listeners in Germany and all around the world? I love Germany! I lived in Hanau for two and a half years. I rode the train to the Funkadelic club in Frankfurt. Ate the bratwurst with the hard bread and the fries with spicy mayo. The autobahn is a little bit scary, but I loved it. How crazy is that Benjamino? You found me all the way in a federal prison in Mississippi and I was in your country back in the day. Everybody that appreciates my music, I thank you for the compliment and God bless you. I wanna thank Panhandle King for the connection and you for ugrap.de. Salute to one of the realest, most talented people I know. A true definition of a hustler. The MVP! A True Scholar, in Street Literature the Most Valuable Person one can have the honor of meeting. Salute to Goldie author Warren G. Charlton, his novel TEARS, is one of the best reads you can read. His penmanship is of the level of Guy Johnson and Sista Souja. Keep your head up brother, we miss you. May God continue to Bless you. This too shall past!! Love you Warren G.! !